Whether it's the first day of a new school year, coming back to school after a holiday break or starting school again after many years, there always seems to be mixed emotions that we process. Whether public school, online school, home education or private school, life is busy when school is in! There's a flurry of activity leading up to starting again including planning, supply purchasing, clothes shopping and more. 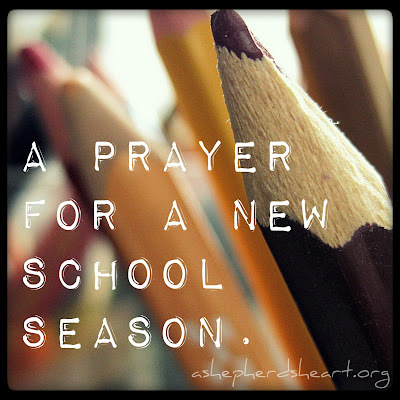 There's anticipation of the new season and sometimes anxiety of the unknown or the "what ifs"
I pray that You would please Help each student and or parent trust that You are in every details. Please give them a special portion of your grace. I pray that every anxiety would be calmed and removed. I pray that the "what ifs" would be sorted out or removed. I pray that You would give each student wisdom to do each assignment they are given and please help them own it. Help them to study with diligence. Help them to see their potential in all things and know their capability and worth as they will face opposition. Help them to listen to Your truth and wisdom and the truth wisdom You give their parents too. Help them not to believe the negative things that may be spoken to them by peers or others and may they not make those wrong things a "fact" in their own heads. Help them to have confidence in themselves! Help them no matter the class setting to be sensitive to others as well as each of their class mates is facing their own battles and challenges each day whether they admit it or not. Help them to respect their teachers, coaches, all other staff members and classmates. Help them to somehow consider their part in setting others up for success in what they do as their behavior through attitudes and actions definitely impacts others in a negative or positive manner. Help them to somehow have fun and enjoy the school journey and grow all the more as the season progresses. Please provide a way for good and reliable nutrition for them so they can focus and participate effectively. Help them to seek out and have good influences! Help them to make good friends that are truly for them! I pray for the parents for their strength and wisdom as they will and are busy right along with their children and even more so if they are part of home education. I pray for the parents who will have many late conversations with their kids, projects etc surround school, homework and relationships. When they don't have the answers, I pray that You provide the answers for them. Give them an extra portion of Your grace. Please give them endurance and strength. Provide for their every need and give them hope and faith that their children will progress well in their seasons of education and one day be launched into adulthood! Provide for curriculum, supplies, uniforms, additional tutoring, classes, fundraising needs and more. Help them to have confidence in themselves and know that they are adequate, capable and they are enough! Help them to not worry about "keeping up with the Jones's" when it comes to what they can or cannot provide for their children whether clothing, curriculum, etc as each parent has to live within their own means and do their best for the children You've blessed them with. Help them live within their means and not acquire debt just to keep up appearances or because of a misguided idea that they need to provide a bunch of extra things for their children that they can do without. The same is true about the idea that as a parent they should take on debt to pay for their children's post high school education...again, help them to live within their means. Provide reliable transportation for them and give them strength as they drive their children to and from all the school activities, extracurricular activities. Help each parent not judge other parents for they educational choices and path they take that they feel is best for their children. Help each parent to not be petty or concern themselves with trivial things. Help each parent be supportive of other parents, students and teachers. Help them to know they are capable and adequate teachers. Help them to have the supplies and curriculum they need. Help them to have a wonderful and lasting impact on their students. Help them to somehow find joy in what they do. Help them to love what they do. I'm also mindful of adult learners who are in a new school season. Possibly they are going back to school after many years away. I pray that you provide for their every need. I pray that they know that they too are adequate and You go before them and are also with them in the details, the planning...the everything! I pray all the same things for the adult learners as I've prayed for the young students. Help each one enjoy the season and realize all the more or maybe for the very first time that You are the all sufficient one and You see their needs and will provide for their true needs at the right time. I praise you and thank You for hearing my prayers and I ask all of these things in Jesus name, Amen. Absolutely LOVE this! Thank you for sharing. Thank you Miss Dickens for your comments and encouragement! May God richly bless you! The Fruit of The Spirit - Get Ready To Grow!